We increasingly live in an instant-gratification world: Smartphones give us instant access to more information than we can process in a lifetime, popular movies and TV shows are available 24/7 via streaming services, and all-night drive through windows have never been more popular. We rarely have to wait for anything, and when we do, we don’t like it. We understand that you just placed your order and are super-excited to receive your Curtain-Tracks products. The waiting is torture! We haven’t yet figured out how to stream our tracks and drapery hardware to you through your smartphone, but we can get them to you with some pretty fair shipping and delivery times. 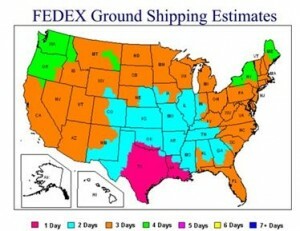 Shipping and delivery times vary, but generally take 4-5 business days in the continental US. Whether you have a commercial or residential curtain track order, it arrives in our inbox and we hop to it. The order is filled and heading out of our doors in one to two business days. From our place, the laws of physics and geography take over. We ship our products from Houston, TX. UPS and FedEx ground services’ shipping and delivery times vary, but generally take four to five business days in the continental US. All told, you are likely to get your tracks and drapery hardware in about a week. There are times when you just can’t wait. We understand and try to oblige. We offer same or next day shipping (before 2pm central) for some items, but remember to select this shipping option on the order! And for some things – you will have to wait. Custom curtain orders simply can’t be produced in 1-2 business days. It takes us two or three weeks to make those orders, because we want to get them right, and do them well. We want your items to get to you quickly, but fast shipping and delivery times are meaningless if the product doesn’t arrive in one piece. Our tracks are strong and durable, but they are long and slender, and anything that is not in a cube-shaped box is in peril in the shipping world. To protect our tracks we ship them in the sturdiest shipping tubes available, which, unfortunately does result in some increased shipping costs from FedEx and UPS due to the irregular shape and special handling. Have questions about our shipping and delivery times? Give us a call at 888-434-7444.